This morning we hear the good news moment in Sarah’s life from chapter 21 of Genesis. God had promised a baby, and now, a baby is born. But to deepen our understanding of that good news, we need to do a little bit of a rewind, and to see what has happened in the lives of Sarah and Abraham since last week. In chapter 16, more years go by and still no baby. Sarai gets tired of waiting for God’s promise and she sends her servant girl Hagar, to have a child with Abram. In the ancient world, this was considered one way to have a child, but it wasn’t the way God was going to keep his promise. It’s not that God is uninterested – after Ishmael was born to Hagar, God promises that through Ishmael also, a nation will arise. But God’s promise to Abram and Sarai is not yet fulfilled. And in Genesis chapter 17 – Abram now 90 years old, and Sarai 80 – God again reminds them of his promise. God says, “Abram, you will be the ancestor of a multitude of nations… and your wife Sarai will bear a son.” And, as a sign of that promise, God changes their names from Abram and Sarai to Abraham and Sarah. Abraham means ‘father of many.’ And Sarah means ‘princess’ – a name which means, she will give birth to a nation. And then more time passes, and we come to our reading today. Abraham now 99 and Sarah 89 – still no child. And, as the story reminds us, they are well past the years of being able to have children. 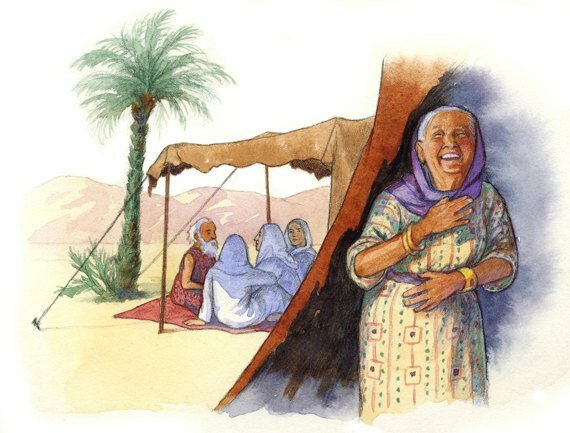 (18:11-12) And three messengers show up and speak for God, saying, “Sarah will have a child.” And then we are told that “Sara laughed to herself,” not a laugh of joy but a laugh of disbelief. And a year later, Sarah gives birth to Isaac. So, what does this story have to say to us in our life of faith? Well, at least three things. First, it tells us that God is a God who makes promises. God makes promises to us and God keeps those promises. And notice that God often symbolizes the keeping of his promises with names – Abraham, ‘father of many;’ Sarah, ‘princess’ – and then Isaac. In Hebrew, the original language of the Old Testament of the Bible, the word for ‘laughter’ is Isaac. The name of the child becomes laughter. Names connect us to something bigger – a family, a history, a heritage. And, of course, our most important name is given to us in our Baptism: “Child of God.” God’s promise iis that we belong to him forever. We are never alone. He is our helper. He is our Savior. God makes promises. And God keeps his promises. That’s the first thing to see. Second, this story has something to tell us about who God is for the world. Remember that God promised Sarah and Abraham, “You will be blessed so that you will be a blessing.” God is a God of blessing. Sin and brokenness – all the stuff that we face in life – it is not God’s purpose. God is on a mission to love, save, bless and redeem all creation. God blesses us, and then calls us to participate in his mission to bless others. We learn, in the Bible, that God blesses because of who God is, not because of who we are. Sarah and Abraham were nor perfect people, and yet God chose to bless them. Throughout the Bible, God blesses imperfect people and calls them to be a blessing to others. We do not earn or merit this blessing from God – it is a gift of grace. And God wants us to realize that we have been blessed, and to join in his mission to love, save, and bless all of creation. And that’s what we’re about at St. John Evangelical Lutheran Church. We’re blessed to be a blessing to others – right here, in our community, and in the world. We make kits and quilts and clothes, to send all around the world. We feed, clothe, and shelter others. We share God’s blessing in our words, in our visits, in our actions. We support God’s mission through this church. We reach out to neighbors in need. We do this, because of who God is – God is a God who blesses. And so, we participate in God’s Mission to the world. Finally, this story of Sarah and Abraham and Isaac is a story about laughs, and it tells us that our God is a God of last laughs. How many times in your life have you been overwhelmed with stress or sadness or depression and you didn’t know if you’d ever be happy again? This story tells us that God sticks with us through our times of suffering and God is a God of last laughs. God turns Sarah’s scornful laughter into joyful laughter at the birth of Isaac. In our Gospel reading, Jesus announces God’s blessing on those who mourn, those who hunger, the poor, the persecuted. Jesus is telling us that our suffering does not separate us from God, nor does suffering void the promises God has for us. I love the verse in Psalm 30 – it’s verse 11 – and it says, “You, O Lord, have turned my sorrow into joy.” There’s much sadness in the world. Our mission is to go out, and when we experience other people in sadness, to bear witness that we believe God can turn sadness into joy. And even in that last moment of sadness that we all face – death – God promises that he will turn even that darkest moment of sadness into joy. As Christ was resurrected, so also God will turn our sadness into dancing. God of Abraham and Sarah, there is truly nothing too wonderful for you. In her old age Sarah laughs out loud with her baby’s son laughter. You are the God of last laughs, even when all hope seems lost, and sadness overwhelms. Be present in our life, turning Good Friday into Easter and sorrow and sadness into dancing. We pray this in Jesus name, Amen. Thank you on e again for an excellent sermon.